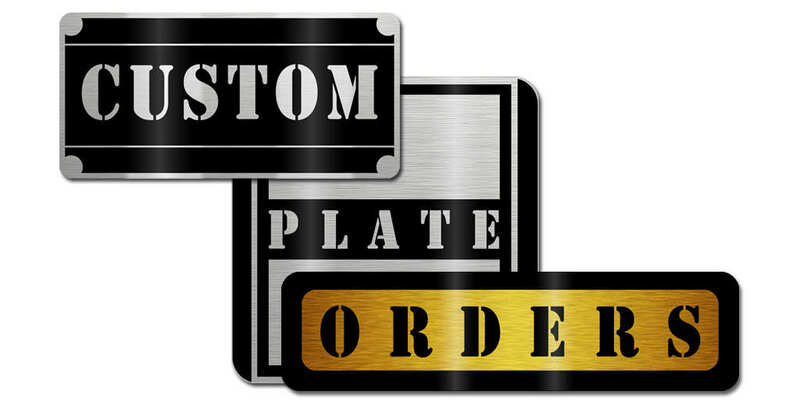 Using the information you provide we can produce custom VIN plates made to your specifications. Please complete as much of the form as you can, and also provide images where possible. We will send you a proof image of your design to the email you submit. When you are happy with the layout we will arrange for payment to be made, you can pay by PayPal, credit or debit card. We cannot stamp, engrave or print the VIN numbers on your custom plate, you will need to find a business that provides a stamping or engraving service. For legal reasons, we cannot print copyright protected logos. However we may be able to print defunct vintage logos from businesses that ceased trading over 30 years ago, it is the customer’s responsibility to make sure that the logo they upload does not breach copyright law. Another option would be to have your own business or dealership logo printed onto the plate. If you choose a plate size that we currently stock it will cost £15. If you choose a Special Order plate size the cost will be £20. If you damage your custom plate whilst fitting, stamping or engraving it we will give you 40% off the regular purchase price for a new replacement plate, click here to make a request. All prices include free 2nd class UK postage, a 1st class UK postage option will also be available when you make your purchase. International postage charges will be added at the checkout. Your Email (required). Use your PayPal email if you have one. (Optional, but useful) Please upload an example image of your old VIN plate or a similar style plate for us to copy. The photograph needs to be legible and not taken on an angle. You can send images you have found on the internet. If the image does not have the correct dimensions we will rescale it to fit your chosen plate size. (optional) You can also upload a copyright free logo or your business logo to be printed on the plate design. Optional details: Please provide any additional information you think we may require for your plate design.